Thank you to everyone who downloaded my morning routine printable. Routine was a really big part of my recovery from Anxiety and today I want to share the next printable in this series – Evening Routine. I suffered with debilitating insomnia when I was at my most unwell and one of several things that helped me overcome it was having a good bedtime routine and better “sleep hygiene.” In today’s post, I’ve listed some ideas you may want to try before going to sleep to help you wind down and relax a little more. This sounds obvious but watching, listening to or reading about something violent, depression or unpleasant just before bed can have a big impact on sleep. When I was at my worst I avoided certain forms of news or gruesome television before bed to aid a more peaceful night. I had enough mental demons to worry about without adding to them! Going to bed at roughly the same time every night helps our bodies get back into a good sleep pattern. Also, try to avoid going to bed too late. I’ve noticed that the odd occasion where I struggle to get to sleep nowadays is usually when I’ve stayed up way past midnight and then get into a panic about getting enough sleep. I’ve written about this many times but a short mindful meditation session during the evening can help ease Anxiety and keep you more present. Personally I prefer to do this earlier in the evening rather than just before sleep to avoid feeling pressure to get to sleep. If you’re very unwell at the moment and your insomnia is really severe you may have been offered a sleeping aid. I took Zopiclone for two weeks during my initial breakdown and, although it’s not something you would want to take in the long term, it can be a really useful tool to kick your body back into the right sleep routine. Many others find herbal remedies helpful too. Many people find good sleep hygiene can include a mini pampering session. I have kept the same simple bedtime routine (brush teeth, brush hair, cleanse and moisturise for years now as I’ve read that doing these same repetitive self-care acts can psychologically prepare you for sleep when repeated regularly. I get my notebook out just before bed to write down two or three things I’m grateful for or positive events that have happened that day – no matter how small. I’ll confess I don’t do this as often as I did during recovery but back then it was a really helpful tool and helped to end the day on a more positive note. Similarly, if you are consumed with lots of worries at the moment scrawl them all down in a notebook just before sleep in an attempt to get them free from your mind and out on the page instead. This should be free writing with no restraint and resist the urge to read it back afterwards! Lastly, and most importantly for me personally, you may need to change the way you think about sleep. When my insomnia was very bad I became obsessed with sleep – how much I got, how it affected me, how well I could cope with less of it etc. 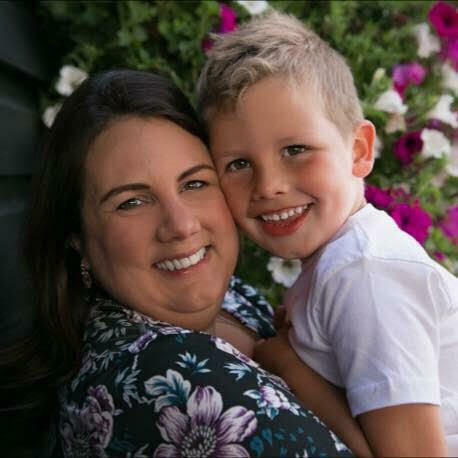 With the help of my therapist I began to reframe those anxious thoughts and question myself. Can I cope without sleep? Yes Will I stay awake forever? No, it’s not humanly possible and so on. Adopting an attitude of nonchalance towards how much sleep I get each night helped dissipate my obsession and, ironically, led to more sleep. 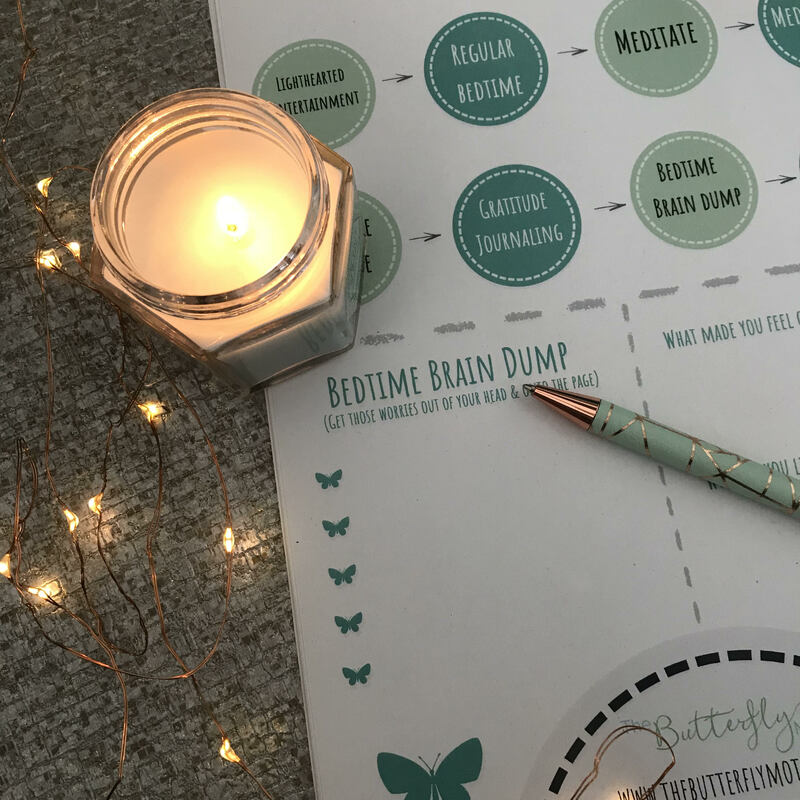 I’ve created a printable to go with this post which contains reminders of these tasks and space for gratitude journaling and your bedtime brain dump. 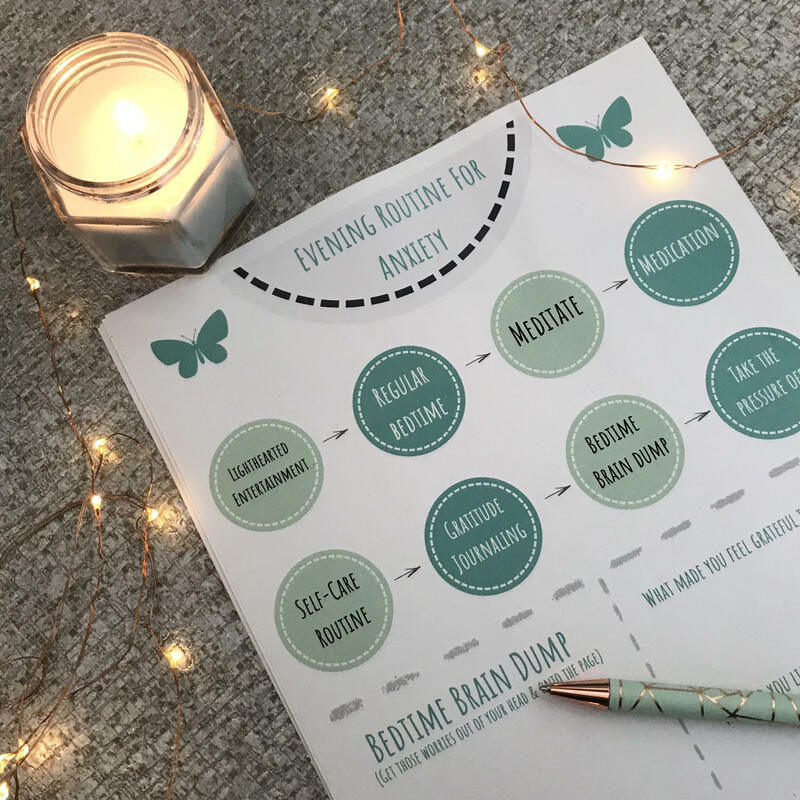 You can access this printable, as well as five others (Morning Routine for Anxiety, Affirmations For Anxiety, Mantras For Mums’ Mental Health, Anxiety Cheat Sheet & Traffic Light Technique Sheet) but entering your name and email below.